We are so excited to share with you our latest creation for the classroom. It is absolutely Spooktacular! 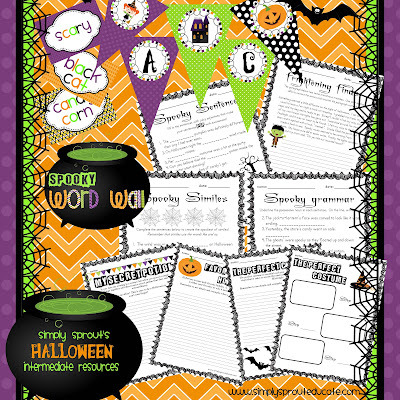 This colorful kit is filled with spooky writing and grammar fun. 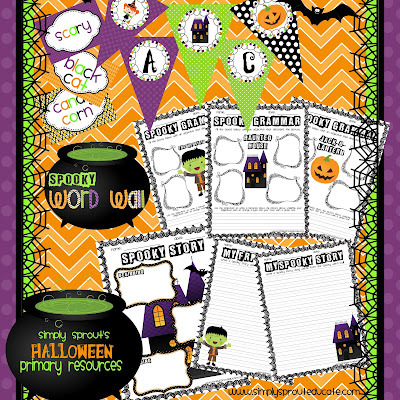 Review nouns and adjectives and get your student's creative spirits going with this hauntingly cute kit! Spooky Grammar: 12 pages Students use adjectives to describe Halloween theme pictures, and write sentences identifying the nouns and adjectives. letters A - z and Halloween themed graphics on four alternating patterns of orange, green, black and purple. We used Halloween decor found around town. Finding items at After Halloween sales will help keep costs down and your seasonal classroom decorations up to date. Our Favorite sales are at Target and Hobby Lobby each year! The colorful pennants are a must have for today's classrooms. Long gone are the days of simply using die cut letters from construction paper. Just print, cut and laminate. They store flat, I like keeping all of my pennant kits in clear plastic page protectors in a 2 inch binder. You can store by theme or colors and can flip through to easily find what you are looking for. For simple hanging hole punch both sides and thread a 1/4 inch ribbon through the entire set of pennants. Cute picture pennants ( bats, haunted house, ghost, jack o lantern) are the perfect way to bookend your Halloween Bulletin Board Banners. The journal pages and grammar pages in this kit are the perfect way to add a simple review into your daily routine while keeping it fun and engaging. Use these grammar sheets as a way to introduce and review nouns and adjectives. Teach students how to stretch their sentences by including their describing words. Have your students use their new grammar skills to create Halloween themed stories, that they will be dying to share with their classmates! While this kit was designed for primary teachers, it can really be used for any grade. Intermediate teachers we haven't forgotten about you we have just what you need as well to keep your little pumpkins engaged while perfecting their grammar skills. Check out our kits that are now being featured in our store, get them now while they are on sale! Our Fall Sale ends Sunday!